This article was originally published in the IOM Family History Journal Vol 6 1984. With a few minor changes, it is reproduced here to share with those who have copies of A QUOTA OF QUALTROUGHS the background and work behind the scenes to publishing the book on a home budget and do-it-yourself basis back in 1983-84. "Having been involved in such an exercise recently and experiencing the excitement of seeing the finished result roll off the printer’s press, I thought it may be worth somebody’s while sharing my method. 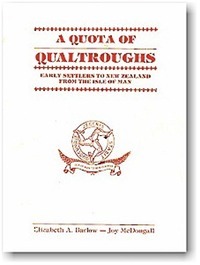 In embarking on the enterprise of publishing the book (A QUOTA OF QUALTROUGHS – early settlers to New Zealand from the Isle of Man; by Elizabeth A Barlow & Joy McDougall) one of the prime objectives was to maintain control of the job as far as possible and it was achieved in the following manner. The Family Story: Being an ‘orderly’ person, I was a little confused by many of the examples of family histories I browsed through at libraries. Many were hard to follow, the genealogical chart sections were difficult for the lay-person to understand and sin-of-all sins, most had little or no indexing. Joy McDougall, a Qualtrough descendant and retired journalist and magazine editor with an interest n history, was approached to write the text from my research notes and her basis for presentation was chronological. The name QUALTROUGH (and variants, discussed elsewhere on the website) originates from the Isle of Man, so to educate the family of its origins, the first chapter was spent discussing the IOM’s early history and geography. By natural progression the next chapter was on the origin of the name (supplemented by an excellent etymology as Appendix 1) and the family’s early connections with the Island. With six lines of migrant Qualtroughs to deal with in the book (one in considerably more depth than the rest), Chapter 3 gave background to each family and their reasons for coming to this far-flung end of the earth. The book then moved to the main family dealt with, to which both authors belonged, and including background to the family in the Isle of Man; their reasons for coming to New Zealand; the Diary written by James Qualtrough (1808-1881) during his family’s voyage to New Zealand on the MERMAID in 1859; their settlement in Auckland, the next generation; their involvment with the Methodist Church; and finally a resume of the large family reunion held in 1979. Joy’s informal writing style and presentation was very pertinent to the overall ‘family-ness’ of the book. Genealogical Charts: This was my domain and I was determined that I would devise a method to present the large family/ies and all their interconnecting branches in such a way for it to be easily followed by the lay-person. I finally decided on a combined version of the common horizontal chart with modern generations ‘hanging’ from the main family in a chart-form of the narrative method used in Burkes Peerage and Debrett’s Peerage. So easy to follow, it allowed for large family branches to be portrayed on one page or a double page. A total of 2156 people are accommodated on 23 charts in 30 pages. I typed these charts on A3 paper and had bromides made, reducing them to a finished book size of A4. For this purpose and for the typing of the whole manuscript, a second-hand typewriter with dual pitch and self-correcting facilities was purchased. Indexing: In my opinion this is the most valuable asset of any book. Surely all genealogists agree. Perhaps I have over-indexed our book, but I do not think so. The text was indexed in three categories and most usefully, the genealogical charts indexed in two categories. Other: Appendices, pre-subscribers name and address list, a section for individuals to add future family information, title page, contents page, preface and introduction pages, acknowledgements, photos, documents, sketches, maps and other material all made the finished product most satisfactory. ‘Do it yourself!" This became my motto! My ‘new’ typewriter allowed for a choice of typefaces which were utilized throughout the book. I had the printers supply me with what is commonly called in the trade ‘grid’ paper. These sheets are sectioned horizontally and vertically with external margins to type to. The center bottom was marked for page numbering. These sectioned sheets proved easy to use and allowed one to make provision for photos. Adequate space was left for chapter headings. Selection of photographs and documents was important and rather than being placed in one or two sections of the book, they were able to be placed at the exact point in the text to where they were referred. Decorative art work and ‘page-fillers’ were obtained from various sources – postcards, other books, etc. Maps were self-drawn and captioned using typing and cut-and-paste, with letraset to complete the job. Captions for photographs were typed also. Next came the preparation of the List of illustrations, maps and documents page, acknowledgements, preface and introduction. Third last was the Contents page, second last the requirements for the reverse of the title page – ISBN number, copyright requirements, publisher and printer information. Finally the design suggestion for the title page and cover. A hard month of proof-reading and copy-correcting followed. Yes, we did our own proofing, much against the advice of others, but feel we did a good job. The manuscript was ALMOST ready for printing. At the printer’s, all that was required of him prior to the printing itself was to copy and place the photographs (all previously tagged with identifying page numbers and captions), the chapter headings, the title page and the cover. Gloss paper was chosen for quality finish and two cover finishes decided upon – a white gloss limp card and a red cloth hardcover with a white gloss dust jacket. The number of copies to be printed was deliberated upon for ages and finally a print run of 500 was decided upon – 380 were of limp-card finish and the other 120 were hardcover. "Do it yourself!" Again my motto! Having been involved previously in the publication of another large genealogical publication, I had a fair idea of costings involved and I was using the same printer. Publication date was set for February 1984. In April 1983. I sent out an informal newsletter and order form to the family in New Zealand requesting a committing order and a small deposit, indicating whether they were wanting soft- or hard cover edition. I soon had a large sum of money in the bank, which I immediately placed on term-bearing interest – every dollar helping in this do-it-yourself business. I anticipated that with all costs (post and packaging, newsletters and order forms, some of my incurred research expenses over the years, the printer’s estimates etc. ), the whole job would be about $NZ 7,000 approximately. I costed out the individual copies at $15-00 post paid in NZ (extra for overseas) for the limp covers and $24-00 post paid for the hard covers. Of a print run of 500 copies, 400 sold would see most expenses covered. My next marketing step was advising other Qualtroughs overseas of the impending publication. Response was gratifying. Final marketing area was public libraries and their response was excellent. They of course expected and got credit terms. To family members who had pre-ordered, another newsletter and final account was sent in December 1983, giving latest information on the book and requesting final payment before dispatch of order in February. This infiltration of funds was again put in an interest-bearing deposit for those extra dollars. D-Day arrived in mid-March 1984, the delay being caused by problems with the cover and binding. However the wait was worthwhile. The satisfaction of seeing one’s project nearing completion is hard to describe. "Nearing completion" is an understatement!! The final huge job was dispatching all the orders. The dining table did not see a meal for a week! Instead it was home base for ordered books, paper, string, tape, packing etc. And that isn’t the half of it! The postal clerk grimaced every time she saw me arrive with my huge cartons of parcels. Postage was a large expense, especially the 60 copies sent overseas, some airmail. Several complimentary and review copies were also sent. So as I write this, describing my experiences, I am still dispatching orders. Joy and I are pleased with the finished result. We have learnt much and it is hoped that by sharing our experiences, others will be encouraged to participate in such a project too. What better way to collate and share our heritage with others." It is 16 years since I wrote that article. Would I do it again, I don’t know!! In the meantime computers and desk-top publishing have changed the face of such projects. Being involved with the creation of the QUALTROUGH FAMILY website is perhaps the completion of the journey for me.